A look at how artists created League's first animated portrait. Elementalist Lux’s story is one of internal struggle, and each of her ten forms was deliberately crafted to embody a particular emotion. Trying to capture the subtlety of sentiments in a typical login animation presented a challenge. 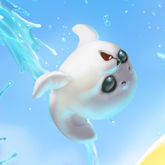 In past login screens, champ’s were often portrayed from a distance, making it difficult to read their facial expressions. To better communicate Lux’s emotional journey, artists created League’s first portrait-style login animation. When looking at a champ’s silhouette, there are visual clues that help distinguish one from the other. An oversized pair of gauntlets lets you spot the Piltover Enforcer at a distance, just as a lamp post indicates you’re looking at someone who lacks a real weapon. Without these iconic characteristics, it might be difficult to differentiate, say, Poppy from Tristana at first glance. Artist Suke “hugehugesword” set out to capture Lux’s essence in a still-frame without relying on her complete figure or iconic wand—core components of her recognizable silhouette. After creating an rough version, he approached other Rioters with a question: Does this look like a League of Legends champion, and if so, who? For the first few rounds of drawings, people sporadically identified the Demacian mage, but many felt she was missing what made Lux feel like Lux: a bubbly, amicable persona. Armed with this feedback, Suke revisited the artwork, highlighting the lights in her eyes and the smile on her face. When he showed people the new drawings, they saw more than a just beautiful face. They saw Lux. In each image of Elementalist Lux, Suke wanted to portray a specific feeling. Her light form is an embodiment of hope, seen in the brightness in her eyes and light dancing on her face. Fire was built on fury, with dramatic, contrasting colors in her hair and an angular face shape to subconsciously convey harshness. Tranquility guided water form, seen in Lux’s restful expression and the cool, calming color scheme. When an illustration is finished, it’s split into layers that motion graphics artist can individually control. For example, Lux’s hair can catch in a breeze without her shoulders and face also being affected by the movement. Some underpainting between layers is often needed so things can move freely without revealing unillustrated areas. Lux’s eyes were created in their entirety to avoid seams from appearing as her gaze shifted. When Suke went back to design Lux’s eyeballs, he was amused by the overlay and sent an image to his team—an internal meme was born. When motion graphics artists Adam “AdamKadamon” Oliveira and Timothy “BumsAreCool” Weiser began working with Suke to add movement to the artwork, they weren’t sure how to bring Lux to life without detracting from the portrait’s intimacy. The previous approach to animating login screens by adding dramatic animation to a ready-to-brawl poses wouldn’t work. The focus was shifted to subtle facial animations, background movements, and transitions. It wasn’t an easy adjustment. In the first attempts at adding motion, Lux’s eyes seemed to scan the room rather lock onto the viewer. “People consistently gave this feedback, ‘I almost wish she didn’t move at all,’” Adam says. The movements were so dramatic that it didn’t feel like she was maintaining eye contact. Giving her eyes more subtle, natural twitches re-established the connection between Lux and onlookers while still adding life to her face. Combining three unique images into one coherent, looping animation was tough. “We wanted the transitions to look like they’re a part of Suke’s art, like they’re just changing it over time,” Tim says. Early versions of these transitions, especially for fire form, featured drastically contrasting colors in an aggressive overlay. It was definitely fire, but it didn’t match with the more abstract, soft art style of the original. The transition felt natural once it mirrored the original color saturation levels and focal point. Besides literally connecting three disparate images, the transitions intensified the emotions embodied by each form. The heat of fire is so intense, for example, that the transitional overlay is powerful and dramatic, while the serenity of water warrants a smooth, rippling effect. 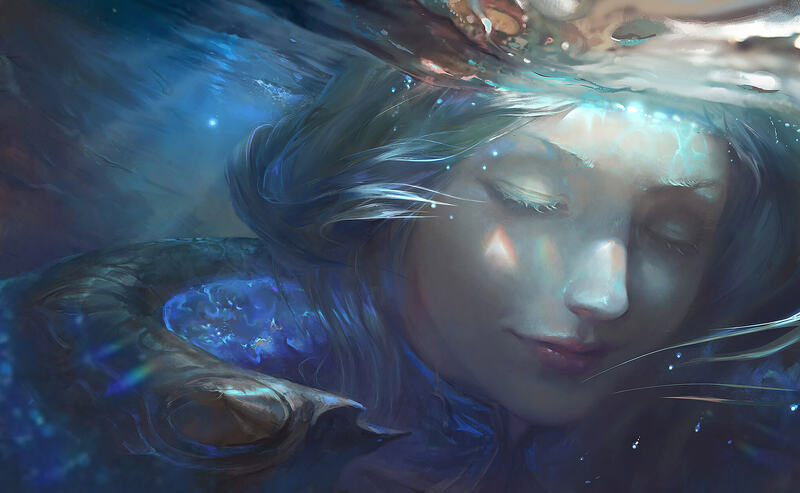 The instant Lux shifts from feeling the fury of fire to the tranquility of water can be seen in her eyes. Adam says, “There’s this moment, less than a second, in fire form where Lux aggressively closes her eyes, like, ‘ARGHH!’ Then, she lets go and finds peace.” Similarly, when Lux opens her eyes after leaving water form, it’s to literally let in the light. This final addition made the transitions feel more than logistic: they represented Lux’s ongoing search for her true nature.